2018 BMW S 1000 R Sport. Picture credits - BMW. Submit more pictures. Its aggressive engine with its 121 kW (165 hp) will put a smile on your face every time it revs up. And the rich sound of the new standard HP titanium rear silencer leaves no doubt: that�s how life in the fast lane sounds. Wheels: Cast aluminium. Black with Red Pinstripe. Comments: Switchable ABS. Riding Mode Pro - includes ABS Pro, DTC Adjustment and Riding Modes Dynamic and Dynamic Pro. 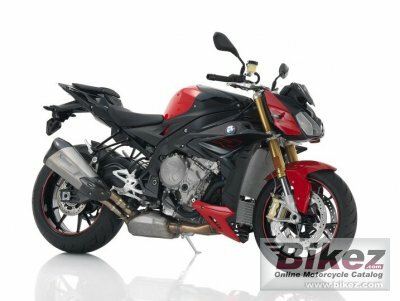 Ask questions Join the 18 BMW S 1000 R Sport discussion group or the general BMW discussion group. Bikez has discussion forums for every bike. View comments, questions and answers at the 2018 BMW S 1000 R Sport discussion group. You can sign up for e-mail notifications when other riders answer you. If you have extensive experience with the MC, please send us a review. If you consider buying this bike, you should view the list of related motorbikes Look at photos. Compare technical specs. And check out the rating of the bike's engine performance, reliability, repair costs, etc. You can compare the rating with other bikes.